As hardware virtualization and software emulation technologies become more powerful and affordable, virtual machines (VMs) have become a much more viable solution for business and power users. While virtual machines have a number of advantages over physical machines, VMs share a few key vulnerabilities with physical hosts. This includes the potential for file system corruption and data loss. Fortunately, the same powerful data recovery tools that work for physical machines can also be used to recover data from virtual machines. 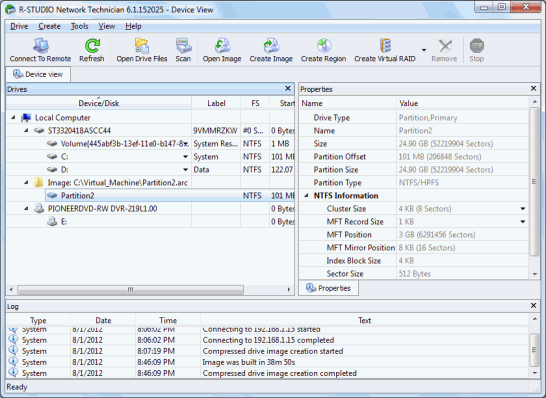 In this article, we'll look at three virtual machine data recovery methods using R-Studio. Each method is tailored to a different type of R-Studio license: R-Studio Technician license, R-Studio Network license and the standard R-Studio local license. 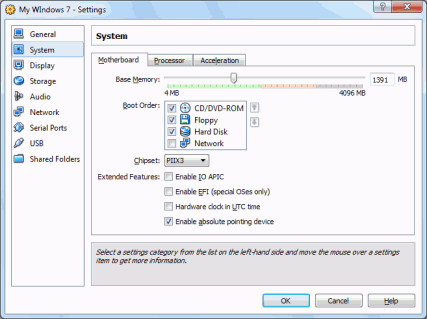 This tutorial shows the steps performed in VirtualBox, but any virtualization software that supports booting from ISO images will work. This method works if you have an R-Studio Technician license, or if you are willing to use an activation code to register a copy of R-Studio Emergency. 1. Create or download the R-Studio Emergency ISO image. 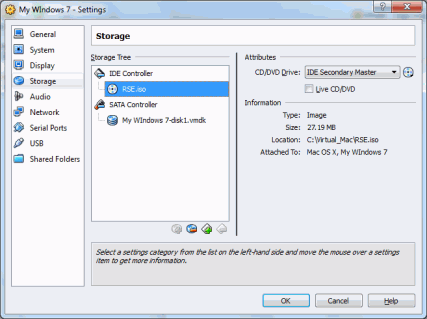 In this tutorial, we've saved the ISO as RSE.iso. 2. Set up your virtual machine to mount the R-Studio Emergency ISO to a virtual CD/DVD drive. 3. Start the virtual machine with the CD/DVD drive as the startup device. You may need to change the boot order so that the CD/DVD drive boots first. 4. The virtual machine will boot into R-Studio Emergency edition. Recover data from the virtual machine as described in the article "Emergency File Recovery Using R-Studio Emergency". Tip: You can use the network capabilities of R-Studio Emergency to store recovered files on the host machine. You can also connect a USB device and offload recovered files to an external mass storage device. 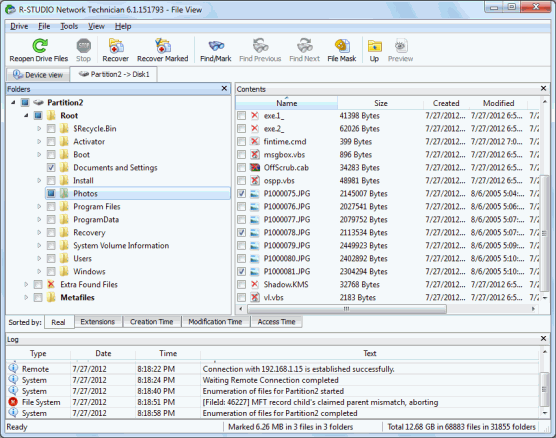 If you have a network license of R-Studio, you can use the R-Studio Agent Emergency edition to perform an emergency data recovery over the network. 1. Create or download the R-Studio Agent Emergency ISO image. In this tutorial, we've saved the ISO as RSAE.iso. 2. Set up your virtual machine to mount the R-Studio Agent Emergency ISO to a virtual CD/DVD drive. 3. Boot the virtual machine with the CD/DVD drive as the first startup device. You may need to change the boot order so that the CD/DVD drive boots first. 4. From the virtual machine, connect to the machine running R-Studio as described in R-Studio's help: Starting a Computer with the R-Studio Agent Emergency Startup Disk. 5. Recover data from the virtual machine as described in the article "Emergency Data Recovery over Network". If you have a standard local license of R-Studio, you can recover data from a virtual machine by creating an image of the drive, saving the image to another location and then recovering the data from the image. 3. Boot the virtual machine with the CD/DVD drive as the startup device. You may need to change the boot order so that the CD/DVD drive boots first. 4. From the virtual machine, connect to the machine running R-Studio as described in R-Studio's help documentation: R-Studio Agent. 5. 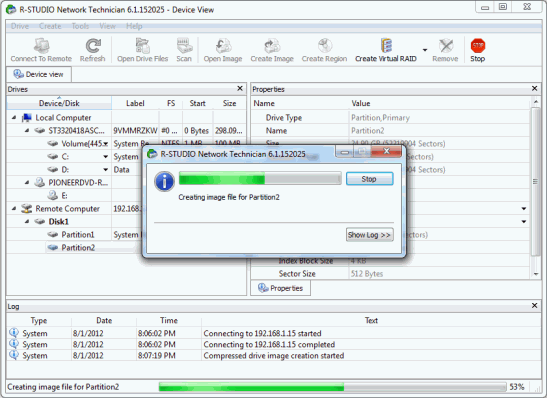 Using R-Studio, create an image of the virtual machine's drive. Save it to another location, such as a network drive or an external USB drive. 6. In R-Studio, open the image and recover the data from it, as described in R-Studio's help documentation: Images. As you can see, recovering data from a virtual machine can be achieved using R-Studio through several different methods. R-Studio's flexibility in working with local drives, networked machines and drive images allows you to utilize R-Studio's full range of data recovery features on virtual machines, just as you would on a physical machine. For additional tips and information, read Data recovery guide.